Find out about 'ENERGY HEALING - 5 Common Questions - Answered' on The Wellness Directory. Then find a Energy Healing practitioner to help you with Tiredness. 1. HOW WILL THIS ENERGY HELP ME HEAL? 2. ENERGY HEALING IS ALL IN THE MIND! IF I DON’T BELIEVE IT, WILL IT WORK? 3. I’VE HEARD OF REIKI - WHAT’S THE DIFFERENCE BETWEEN THESE TWO? 4. WHAT WILL I FEEL & HOW WILL I KNOW IF IT'S WORKING? 5. WILL ONE SESSION HEAL ME? The 7 major Chakras found in the human body Energy Field. Kirlian photograph showing energy permeating from the hands during a healing. The picture on the left shows a depleted Energy Field whereas the right-hand picture illustrates a far more balanced Energy Field. But in saying that, our ‘conscious’ mind may not be in charge of our body’s needs at a cellular or energetic level. Therefore, our inner makeup will definitely respond to universal energy bringing about balance in areas of need. But, if our mind is open to the receipt of energy healing, the body can respond favourably to our *‘intention’ to accept healing. As for energy making a difference, I mentioned above, that every living thing has and is energy which has a vibration. Even the colours in our spectrum have a vibration which is what is used in Colour therapy, so it is about receiving more of the energy we are part of and bringing about balance. Balance = wellbeing. Keeping this thought, it can be said that our energy levels and health can be all in our mind. In the words of Dr Bruce Lipton (a former medical school professor and research scientist) in his latest book Dr. Bruce Lipton: The Biology of Belief - Where Mind and Matter Meet – where his latest research in cell biology and quantum physics is being hailed as a major breakthrough showing that “our bodies can be changed as we retrain our thinking”. He is now an internationally recognised leader in bridging science and Spirit. Energy Healing doesn't necessarily follow a pattern of hand placement as the healer allows themselves to be intuitively guided to where the energy is most needed for the receiver’s body’s energy fields. This allows for each individual’s healing to be divinely guided. With all this good work done Energy Healing can be a wonderful addition to our regular health care, - prevention always being far superior to cure! You can’t overdose on energy healing but allow time between each for adjustments to settle.
. 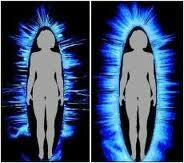 Illustration showing all the human Energy Fields. The responses I receive from my clients who come for Energy Healing leave me feeling very humble. That I can be a channel for divine high vibrational energy that is intended to do the highest good for each person who seeks is a wonderful experience for each of us. I invite you to experience Energy Healing with me for yourself. Contact me today via my website www.nurtureyou.co.nz or call me on my Mobile 027 240 9853. I look forward to being of service to you. Nurture You is about caring for all your health needs by providing a great variety of options to suit your Mind, Body & Soul. Ruth's sound Naturopathic base is greatly enhanced by the use of modern vibrational medicine and powerful Energy Healing skills. Ruth offers an AAWSM process for gently facilitating the release of stored pain and trauma.